There are three sections of Del Mar City Beach. The north area, a.k.a. "Dog Beach", the main area and the south area. With two plus miles of sandy beach, Del Mar offers a great place for many beach activities. Powerhouse and Seagrove Parks are located just above the 15th street surf break and are fantastic places for picnics with family and friends. The North Beach Area (Dog Area) - This section remains open to dogs all year but must be restricted to a six foot leash during certain times. June 16th through Labor Day dogs must be leashed. 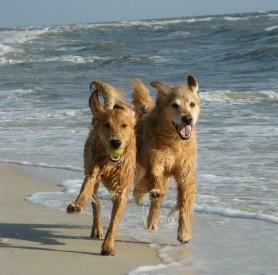 After Labor Day dogs are able to run free under voice control of the owner. Most people don't follow these rules and dates, especially in the north area. The Main Beach Area - June 16th through Labor Day, no dogs allowed! But after Labor Day through June 15th, dogs are allowed but must be leashed. The South Beach Area - Dogs must be leashed year round. Owners should pick up after their dogs at all times, but we all know that doesn't always happen, so its a good idea to wear sandals or flip flops especially when visiting the north beach area. The highlights of Del Mar are the race track and the fairgrounds. Clicking on these links will take you directly to the official websites where you can check schedules, make appointments, get directions and contact information.